I mentioned in the comments on another thread that one Orthodox prelate speaking with this clarity was the recently removed Met. Jonah of the OCA. Met. Jonah was home grown in a sense in that he was an American born Orthodox bishop who has a keen understanding of the currents underlying the Western cultural drift. Met. Jonah’s removal was American Orthodoxy’s loss (See: Removing Metropolitan Jonah Hurt the American Orthodox Church) although long term it may prove to be a blessing because he will be able to speak unencumbered by lesser men who don’t grasp the seriousness of the crisis in Western culture. We need American leaders who 1) understand the complexity of the issues we face, and 2) are able to teach others how the Gospel of Christ, particularly the knowledge of inward orientation of the human person, is the antidote to the debilitating dehumanization — the radical depersonalization — that many of the progressive and liberal theological ideas foster. The fact is that there is a vacuum in American Orthodox leadership that is being filled with with a new generation of ostensibly Orthodox writers and speakers who are steeped in progressive ideas and seek to conform the Orthodox moral witness to them. This is a minor problem so far but without the clear lines such as Met. Hilarion offers below (and as Bp. Chaput in the Roman Catholic Church and others do for their flock), increasing moral confusion is the inevitable result and the antidote to radical dehumanization and depersonalization remains hidden under a bushel. 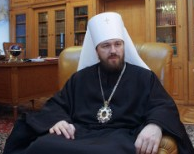 The future of ecumenism is in great peril with the gap widening between orthodox and progressives, says Metropolitan Hilarion of the Russian Orthodox Church a noted theologian and church historian. Hilarion said he was obliged to speak about this because he wanted to preserve the good that was being achieved during the years of dialogue between Orthodox, on the one hand, and Protestants and Anglicans, on the other. “In defending the two-thousand-year-old tradition of the Church, we remain true to this dialogue, yet at the same time we see that Protestants and Anglicans are growing away from us by accepting innovations which we find unacceptable. Hilarion said that in Western society today, the traditional family way of life has, in effect, been destroyed. As a result, there has been a gradual decline in the populations of Western nations. “This is a very simple and real indication of the spiritual health or spiritual disease of a particular nation. If the population of a country is increasing this means that there are in the nation healthy forces which allow this to happen; if the population decreases, this is a sign of disease.” The disease in society is an absence of the traditional notion of the family, he said. Hilarion continued, “The ‘Foundations of the Social Concept of the Russian Orthodox Church’ with the Catechism of the Catholic Church which outlines the official teaching of the Catholic Church on these problems, then everywhere you will see that their positions are similar. This means that we can combine our endeavors in order to jointly protect traditional values such as the family, giving birth, how children are brought up and the integrity of marriage. This is the field where we can and must today interact with Catholics. Hilarion cited several examples. “In Iraq only one tenth of a million-and-a-half Christians that lived there ten years ago have survived. In Egypt we are witnessing a mass exodus of Christians. There are practically no Christians left in Libya. Ninety five percent of Christians have abandoned Homs in Syria. We, Orthodox and Catholics, must raise our voices jointly in defense of Christians subjected to persecution and repression in these countries, as well as in Afghanistan, Pakistan, India, Indonesia, the Philippines, Nigeria and in a number of other countries as well. I hope they make this guy Patriarch someday. I wholeheartedly agree with you, George. We need more men like Metropolitan Hilarion speaking the truth steadfastly, frequently, and lovingly. It is too bad about Metropolitan Jonah, though. Of course those who don’t understand the historically-rich ancient Christian faith will demonize Metropolitan Hilarion as “intolerant.” I recall reading in Father Jon Braun’s “Divine Energy” that while Protestant, he had gotten so tired of doctrines constantly shifting that he became nauseated. And in C.S. Lewis’s “Screwtape Letters,” Wormwood is told that the ultimate plan of destroying the Church was from within, and I truly see that with the myriad of denominations and various false doctrines being spewed and the epidemic of confusion running rampant. Yes. Fr. Paul Tarazi once told me (I paraphrase slightly) that the task is not to bring the faith down to the level of contemporary society, but to raise contemporary society to the level of the faith. Those Christian bodies that imitate secular abandonment of morality in an attempt to be relevant are fulfilling Screwtape’s goal. Met. Hilarion is fighting on the side of Truth. I remember one Christian saying abortion is bad but prostiution is not ok. Well, it isn’t maybe less prostiution less abortion. Let say both prostiution and abortion brought up in the Justinian Code.